I purchased Issue 3 of Lisa Comfort magazine when it came out last year because I knew I wanted to make the Lottie dress that came with it! I finally got around to it! It’s a simple button front dress with a bias bound top/ straps. I used a cotton Rifle Paper Co fabric I’ve had in my stash and I’ve been wanting to use. I also used some buttons I picked up on my recent trip to the garment district in New York. This would have been a pretty quick make but I had some fit issues. I graded the pattern down a size but when I tried it on after sewing on the bias tape, it was so large at the top in the front. It was completely unwearable. The easiest thing to do was to undo the bias tape on the front pieces and to add more gathers. It worked! There’s an optional tie sash included in the pattern. I didn’t make it because I really liked how this vintage belt looks with the dress but I have plenty of fabric left over if I decide I want to make it in the future. I haven’t decided if I’d make this pattern again. I like the style and I like how few pattern pieces there are/ how this can be a pretty quick make. It’s not the most comfortable dress for me because the straps are set a little wide for my shoulders. I think if I were to make it again, I would have to figure out how to make them more comfortable and set in more so they don’t feel like they are going to fall down. Overall, I like how this dress turned out and I am excited to wear it on vacation next month! Here’s my Seamwork Audrey denim jacket! I wasn’t sure about making this pattern at first because I already have a RTW denim jacket. I really loved this gold Cone Mills denim, though so I thought that would be a fun addition to my wardrobe. Here I’m wearing it with a Seamwork Hazel dress I made last year. This is a good pattern but I have to say I hated the instructions. They bounced around so much! For example, in one of the first steps I’m making the sleeve cuffs but it doesn’t say to attach them to the sleeves until one of the final steps! I definitely would suggest reading the instructions all the way through and maybe rearranging them. I also found it easier to stitch several seams before switching out to top stitching thread and doing a bunch of top stitching at once. The instructions have you constantly switching it out after each step and that’s not necessary. I think it sped up my process significantly. And those welt pockets! It was my first time sewing them. I seriously considered just leaving them out after reading the instructions. I started to just go for it and I figured it out. Or I think I did, anyway! They look less than perfect but they are functional pockets so I’m happy. I definitely need some practice with those. As far as fit, I think it’s good. I removed about an inch from the sleeve length so I think that’s perfect. I also removed maybe 1/2” or an inch from the length but if I were to make this again I’d probably make it a little more cropped. I’m very excited to wear this jacket this spring. It will add such a fun pop of color to my outfits. I also kind of can’t believe I made this! I’m really pleased with the end result. I am so excited to share this dress with you! How beautiful is this fabric?! It’s from Fibers to Fabric and is so special because it was hand block printed in India! Fibers to Fabric is located in India where all their fabrics are made. When Vishruti reached out to me and kindly offered to send me something, I was over the moon! There were so many beautiful fabrics I loved. I honestly had a really hard time choosing so I narrowed it down to three and let Michael pick! I’d say he made a good choice! (although I’m sure he couldn’t have made a bad one) The color is a lovely golden yellow and is so cheerful! I of course love the cute little flowers all over it. They look like daisies to me and daisies are my favorite. This fabric is a lightweight cotton and worked beautifully for the Cocowawa Honeycomb pattern. I know this dress is going to be so perfect to wear during the warmer months. As far as the pattern, this was my second time sewing a Cocowawa pattern. The first was my test of the Maple dress and I was able to choose a pattern in exchange for doing that. I’ve seen so many Honeycombs on Instagram, I’m glad I was finally able to make one! It was a pretty easy sew. I decided to add ruffles into the princess seams. Ana has a tutorial for it here. I made my size according to the size chart but I feel like it’s a little large under my arms. I usually have the opposite problem! If I make another sleeveless one, I will definitely cut the underarms higher. Besides that, I really love the design! The ties on the sides are such a cute feature. Can we take a moment to appreciate the pattern matching on my button plackets? I had to cut one of the bodice pieces three times to get it right but I’m glad I took the time to do it! I also had some pattern matching on the back collar and yoke but that was a wonderful coincidence! I really love the finished dress. I’m still waiting for warm weather. I know I’ll be wearing this a lot once it comes. This cotton was lovely to sew with and it’s even lovelier to wear. If you’re looking for some beautiful, handmade fabrics- you’ll definitely want to check out Fibers to Fabric. I still have my eye on their Ikats like this one! I think they’d work perfectly for a Tilly and the Buttons Stevie Dress. This is my second Simplicity 8294. My first one is the version with the gathered skirt and cap sleeve. For this dress, I made the pleated skirt with the arm band. I knew I wanted to eventually make another one of these after my first. I love the collar and the buttons with the tabs is such a cute detail. When I saw this fabric from the new Rifle Paper Co collection, I had to have it! It comes in a navy color way but I just love the mint and how the colors in the print pop against it. I had a quick look through my patterns before ordering and knew this was a good choice! It works great with quilting weight cottons. Plus, I wanted something I made before and liked so I would feel confident cutting into this beautiful fabric! I thought the blue chambray would be a nice compliment to the colors in this fabric and a nice change from just using white like my last one. I picked this up at Joanns and just used white buttons that I had in my stash. I used a regular zipper on the side as the pattern calls for. I do kind of wish I just used an invisible one, though! I find them easier to put in. I hardly ever insert regular zippers so they just don’t turn out exactly how I’d like them to. I basted it in first but I feel like it’s pulling/warping a little bit. It’s probably one of those things that’s only really noticeable to me. I don’t think I’ll bother trying to fix it but definitely making a note to use an invisible zip next time. As far as fit, I made this before so I was pretty confident in making the same size as last time. It is a tiny bit more snug in the waist than I would like, though. So I may take a little bit out of the seam allowance on the side without the zipper. I also noticed that it’s a little tight around the arms, too. I made the cap sleeve version last time and didn’t have that issue. I have more of this fabric so I may eventually swap it out for the sleeve or make the arm a little bigger and sew in a longer arm band. Mint and red is one of my favorite color combos so I love how it looks with my red flats on! Overall I really love this dress, though. I see myself wearing it a lot this spring and summer. Don’t be surprised if you see me make another one of these! Hello! First, I just wanted to let you know I finally upgraded to have my own website domain! It’s poeticmemorysewing.blog and I updated my Instagram username to poeticmemorysewing. I’ve felt like I needed a change for a while now but wasn’t ready to let go of Poetic Memory after using it for 7 years! Anyway- back to the sewing! How amazing is this fabric?! I was at Mood in New York earlier this month. We didn’t have much time so I ran down a few aisles and happened to see this Italian made chiffon! It has foxes all over it which you know is right up my alley. I bought a yard and half figuring I would make a top out of it. I had this blouse in mind but when I looked up the pattern later, I realized I didn’t buy enough of it and was so disappointed. I love the sewing community online because I was told it doesn’t require as much fabric as stated. I managed to cut out the size 8 and still have some left- possibly for a scarf?! This pattern is great for sheer fabric because there’s no neck facing and the seams can be enclosed. I was nervous sewing with chiffon because it’s delicate and frays. Normally I would serge the edges of a frayed fabric but I didn’t want the bulk in the seams. I cut it out with a rotary cutter, put it in a bag until I was ready to work it. I tried to handle it as little as possible. There’s a few seams I wanted to fix but it wasn’t worth it! Overall I’m really happy with it. I paired it with my Seamwork Leonora with my scalloped hem hack and I love this outfit. I also wore it with jeans! It’s definitely a versatile top that I’ll get a lot of wear out of. As I mentioned earlier I cut out a size 8 and am pretty happy with the fit except the sleeves are a little too long. If I make another (which I’m pretty sure I will!) I’ll shorten them probably by a 1/2 inch to an inch. I’m heading back to Mood in a few weeks and can’t wait to see what I find! I am so thrilled to share this jacket. I really think it is my favorite thing I have ever made. I have been wanting to make a Closet Case Patterns Kelly anorak for a while now. I have seen so many lovely versions of it. I also had a jacket in this style that I wore a lot but I had gotten rid of it during one of my wardrobe clean outs. I felt a hole in my wardrobe because I didn’t have a lightweight jacket to wear in the spring and fall besides my denim jacket (which I don’t love to wear with jeans…) I added the pattern to my Make Nine for this year thinking I would carve out time to make a lined version for the fall. When I was looking at the new Rifle Paper Co fabric collection and saw this canvas– I immediately envisioned this jacket and those plans changed. I have never ordered fabric or a pattern so fast! It jumped to the top of my sewing queue as I impatiently waited for my parcels to arrive. I couldn’t wait to make this jacket a reality. The Kelly Anorak is a great pattern if you are looking to up your sewing skills. There are things I have never done before- gusset pockets and a zipper placket to name a couple. Overall the instructions were easy to follow but I did find myself looking at the sew along on their blog a few times. I found it especially helpful at the pocket stage. I find myself leaning towards quick and satisfying projects more and more these days so I admit I was a little impatient while making this. I spent one weekend day and quite a few evenings working on it. I’m really happy with the inside of the jacket as well. I chose to use flat felled seams since the jacket is unlined. I also used bias tape at the hem and at the hood. I just ended up serging a couple seams- the arm holes (honestly because it was easy) and the bottom on the sleeve (because I couldn’t get my machine in there). I managed to pattern match on the front and back yokes. These are the most noticeable seams to me so I am glad I was able to do that. I would have loved to of matched more seams but I just didn’t have enough fabric to do that. I also made a silly cutting mistake where I cut along the wrong size line for the back jacket and had to recut! Thankfully I was able to cut some other pieces out of that mistake. This jacket is everything I wanted it to be. I can’t believe how smoothly it came together. I know I am going to wear this so much. It’s my favorite and probably most practical make. I am still thinking about making a lined one the fall! Hello! I recently pattern tested CocoWawa’s newest pattern- the Maple Dress! It’s a double breasted collared dress with three different sleeve choices, 2 lengths and optional piping/ruffles! And of course the best part- pockets! It can be sewn in many different fabrics so it can be made and worn the whole year. I made the 3/4 sleeve option. I was between two sizes so I sized down because I preferred it to be a little more fitted. I picked a blue and white seersucker that I found at Joann’s. I thought this would be perfect for the spring and summer time. I can picture throwing it on with some sandals and walking the boardwalk! I didn’t make the short sleeve because I thought it would be nice to be able to cover up my arms a little. I’m so pale so keeping the sun off me is important! I also found these heart buttons at Joann’s and didn’t hesitate to get them. I like the playful touch it gives to the dress. I do wish I had moved the button holes over though because these buttons are pretty large and don’t fit as well on the facing as they could, causing a slight pucker. This dress was a pretty quick sew. The collar was the trickiest part but totally do-able! Ana has made a video tutorial to help! I strongly suggest you give it a go if you are hesitant about sewing a tailored collar. There are so many lovely versions of this dress. I definitely want to make another Maple, in a fabric with more drape and add the ruffle! 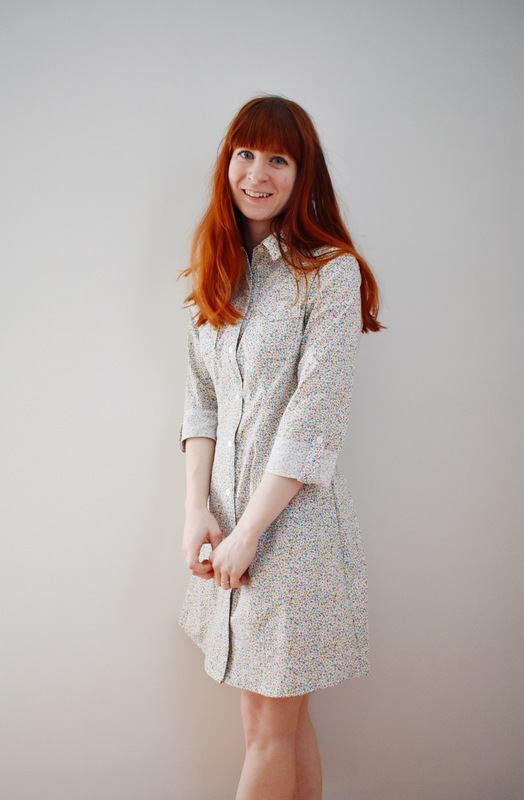 The Maple dress is available as a PDF and printed pattern.